Imagine being able to know if you have Parkinson’s disease, multiple sclerosis, liver failure, Crohn’s diseases, pulmonary hypertension, chronic kidney disease, or any number of cancers based on a simple, non-invasive test of your breath? Breath analyzers to detect alcoholhave been around for well over half a century—why not apply the same concept to detect diseases? A global team of scientists from universities in Israel, France, Latvia, China and the United States have developed an artificial intelligence (AI) system to detect 17 diseases from exhaled breath with 86 percent accuracy. The research team led by Professor Hassam Haick of the Technion-Israel Institute of Technology collected breath samples from 1404 subjects with either no disease (healthy control) or one of 17 different diseases. The disease conditions include lung cancer, colorectal cancer, head and neck cancer, ovarian cancer, bladder cancer, prostate cancer, kidney cancer, gastric cancer, Crohn’s disease, ulcerative colitis, irritable bowel syndrome, idiopathic Parkinson’s, atypical Parkinson ISM, multiple sclerosis, pulmonary hypertension, pre-eclampsia toxemia, and chronic kidney disease. The concept is relatively simple—identify breathprints of diseases, and compare it to human exhalation. What makes it complicated is the execution of the concept. For example, how to identify the breathprint of a disease? Is it unique like a fingerprint? To answer this question requires a deeper look at the molecular composition of breath. VOCs are the common factor in the smelling process for both breath analyzers and humans. When we inhale, the nose draws in odor molecules that typically contain volatile (easy to evaporate) chemicals. Once the odor molecules contact the olfactory epithelium tissue that lines the nasal cavity, it binds with the olfactory receptors and sends an electrical impulse to a spherical structure called the glomerulus in the olfactory bulb of the brain. There are approximately 2,000 glomeruli near the surface of the olfactory bulb. Smell is the brain’s interpretation of the odorant patterns released from the glomerulus. 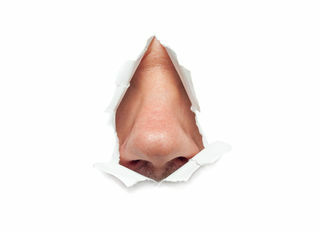 The human nose can detect a trillion smells. In Haick’s researcher team, nanotechnology and machine learning replaces the biological brain in the smelling process. Haick’s team of scientists developed a system, aptly called “NaNose,” that uses nanotechnology-based sensors trained to detect volatile organic compounds associated with select diseases in the study. NaNose has two layers. One is an inorganic nanolayer with nanotubes and gold nanoparticles for electrical conductivity. The other is an organic sensing layer with carbon that controls the electrical resistance of the inorganic layer based on the incoming VOCs. The electrical resistance changes depending on the VOCs. By applying cross-disciplinary innovative technologies from the fields of artificial intelligence, nanotechnology, and molecular chemistry, diagnosing a wide variety of diseases may be as simple and non-invasive as a breath analysis using a handheld device in the not-so-distant future. Nakhleh, Morad K. , Amal, Haitham , Jeries, Raneen , Broza, Yoav Y. , Aboud, Manal , Gharra, Alaa , Ivgi, Hodaya, Khatib, Salam, Badarneh, Shifaa, Har-Shai, Lior, Glass-Marmor, Lea, Lejbkowicz, Izabella, Miller, Ariel, Badarny, Samih, Winer, Raz, Finberg, John, Cohen-Kaminsky, Sylvia, Perros, Frédéric, Montani, David, Girerd, Barbara, Garcia, Gilles, Simonneau, Gérald, Nakhoul, Farid, Baram, Shira, Salim, Raed, Hakim, Marwan, Gruber, Maayan, Ronen, Ohad, Marshak, Tal, Doweck, Ilana, Nativ, Ofer, Bahouth, Zaher, Shi, Da-you, Zhang, Wei, Hua, Qing-ling, Pan, Yue-yin, Tao, Li, Liu, Hu, Karban, Amir, Koifman, Eduard, Rainis, Tova, Skapars, Roberts, Sivins, Armands, Ancans, Guntis, Liepniece-Karele, Inta, Kikuste, Ilze, Lasina, Iev, Tolmanis, Ivars, Johnson, Douglas, Millstone, Stuart Z., Fulton, Jennifer, Wells, John W. , Wilf, Larry H., Humbert, Mar, Leja, Marcis, Peled, Nir, Haick, Hossam. “Diagnosis and Classification of 17 Diseases from 1404 Subjects via Pattern Analysis of Exhaled Molecules.” ACS Nano. DOI: 10.1021/acsnano.6b04930. November 2017. Scudellari, Megan.”Breathalyzer Distinguishes Among 17 Diseases at Once.” IEEE Spectrum. January 5, 2017. Lawal, Oluwasola, Ahmed, Wagar M., Nijsen, Tamara M.E., Goodacre, Royston, Fowler, Stephen J. “Exhaled Breath analysis: a review of ‘breath-taking’ methods for off-line analysis.” Metabolomics. August 19, 2017. Shirasu, Mika, Touhra, Kazushige. “The scent of disease: volatile organic compounds of the human body related to disease and disorder.” The Journal of Biochemistry. September 1, 2011. Pauling, Linus, Robinson, Arthur B., Teranishi, Roy, Cary Paul. “Quantitative Analysis of Urine Vapor and Breath by Gas-Liquid Partition Chromatography.” PNAS. October 1971. Phillips, Michael. “Breath Tests in Medicine.” Scientific American. July 1992. Popov, Todor A. “Human exhaled breath analysis.” Annals of Allergy, Asthma & Immunology. January 22, 2011. Bushak, Lecia. “How Does The Nose Smell? The Inner Workings of Our Sense Of Smell.” Medical Daily. March 5, 2015. Williams, Sarah C.P. “Human Nose Can Detect A Trillion Smells.” Science. March 20, 2014.